JDP offers a range of extruded polypropylene and woven polyester geogrids, which are widely accepted as giving the best performance and longer-lasting results for soil reinforcement. Extruded geogrids, such as Tenax fall into two categories to suit a wide variety of applications: the mono-orientated TT range (strength in one direction) offers the ideal solution for the construction of embankments and earth walls that are stable at inclinations of up to 80º. The bi-orientated LBO range (strength in both directions) offers extremely high performance for ground stabilisation in road construction. Woven geogrids offer high strength at low elongation and are available as a bi-axial geogrid (strength in both directions) and as a uni-axial geogrid (strength in one direction). 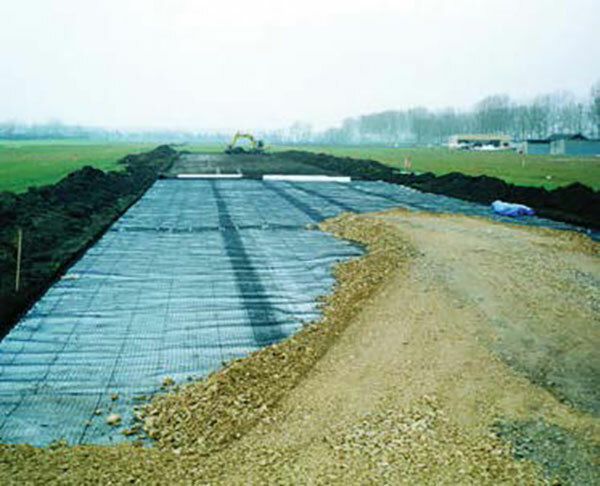 These geogrids offer cost savings against extruded geogrids where such a high performance is not required. Whatever the nature of your project, JDP will give you expert advice in selecting, the appropriate product and offer cost effective solutions.